The CIP (Control and Information Protocol) driver type provides an interface between VTScada and hardware that uses the CIP or ENIP standards or both for communications. It has been reported that response time from the CIP driver has been improved by increasing the system overhead time slice setting within the PLC from 20% to 70% using Logix 5000 or Studio 5000 software. Use this information with caution, taking your unique situation into account. It may be less relevant for newer systems. DINT - a 32-element array of DINTs. The VTScada driver can read and write to all of the atomic data types within the structure. The VTScada driver can also read a stream representation of a structure; it does not have any knowledge of the contents of the structure. At present, the driver cannot write an entire source. It should be noted that even the atomic data types are themselves structures (of a special sort that can be read and written). For example, an INT is actually an array of 16 BOOLS, 1 representing each bit in the INT. It is possible to read and write a bit of an INT by addressing it correctly (i.e. INT_TAG1|INT will write to the least significant bit of INT_TAG.). This driver has the ability to save the last value written to each output tag, and to rewrite those values, either automatically when lost communications are restored, or manually by the press of a button. Carefully review the information in the Connection tab to decide whether this feature should be used in your application. If this driver is being used in conjunction with a Driver Multiplexer, then configure the Driver Multiplexer to store the last values, not the drivers connected to the Multiplexer. In this case, only the Multiplexer should be configured to re-write automatically. 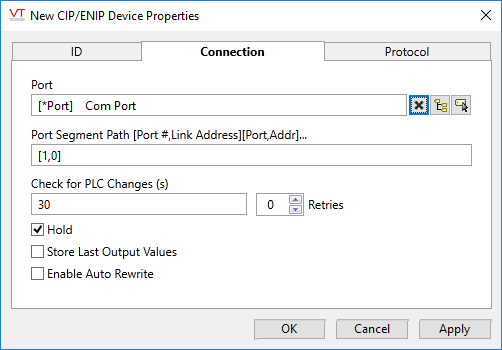 The Connection tab for a CIP driver enables you to configure the port through which communications with the hardware will take place. Note: The TCP/IP Port Tag should be usually be configured to communicate with the PLC on port 44818 (0xAF12). You should confirm this against your PLC’s configuration. Select the TCP/IP tag that will provide the address and port to be used when communicating with the PLC. The Port Segment Path format is [Port ID, Link Address], and describes the path to access the data. The Port ID is a number that describes the port by which the message will exit the communications card that received it. Port ID 2 and 3 are the communication port of the communications cards. For example port 2 on a DHRIO type card is DH+ channel A while port 3 is channel B. The Link Address is the destination address of the message for this pair of the port segment path. You may provide an IP address for Ethernet network, slot number for a backplane, node number for DH+ and ControlNet networks and station address for DF1 networks. For example when accessing the CPU with a built-in Ethernet port, the Port ID would be 1 for the backplane and the link address would be the slot number of the CPU. If the CPU is in slot number 0 the Port Segment Path parameter should be set to [1,0]. In newer CIP devices such as the 1756-L83E processor, use  rather than [1,0]. The message destination is slot number 5 of the backplane. The message will be directed to slot number 5 on the backplane, then out port 2 of the Ethernet card to IP address 10.158.2.20 and then to slot number 0 of that backplane. You must be familiar with the hardware to which you are connecting in order to correctly establish the Port Segment Path. The CIP driver reads the entire PLC tag configuration into memory before initiating any reads, allowing it to poll data by an index instead by PLC tag name. This results in considerably faster performance. The full read of the PLC tags names does take time, but is done only once and stored. It is necessary to scan the PLC periodically to see if anything has changed. This is a single transaction that indicates whether or not another full read is required. The default of 30 seconds is recommended for most installations, but may be extended if you are confident that the PLC configuration is not changing. Operators may force a read at any time by using the “Read PLC Tags” button on the CIP Driver Command dialog. The Hold check box controls whether this driver should hold data from the PLC or RTU in the event of a communications failure. If the Hold check box is selected, the last received value from the PLC or RTU will be held. If the Hold check box is not selected, the data will be invalidated in the event of a communications error. By default, the Hold check box is not selected. The Retries spin box enables you to select the number of attempts that will be made by this driver if there is no reply to a message. An error will be declared after this number has been reached. For hardware that does not maintain its state during a power loss and must be restored to that state when re-started. When failed hardware is replaced by a new device and you would like to start that device with the values last written to the old one. Automatically, when communication is restored to the device. Manually by way of a button press. See, Rewrite Outputs Widget for details. Changing this value from checked to unchecked will cause all stored values to be erased immediately. If checked, the Store Last Output Values option will also be activated. This option causes the driver to automatically rewrite the last value written to each output, in the event that communications are lost, then restored. Use this option only if you are certain that you want the last values to be rewritten automatically after an interruption in driver communications. 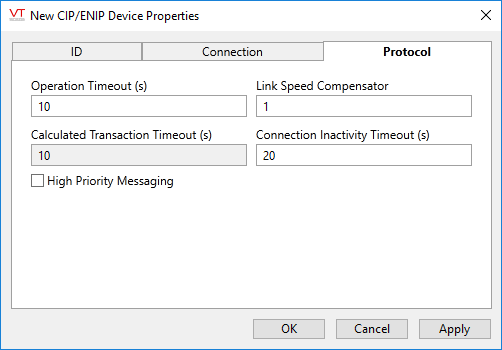 The Protocol tab for a CIP driver enables you to configure settings related to operation timeouts. The properties are part of the communications protocol. You must be familiar with the CIP protocols in order to properly configure them. If the default values for these properties are enabling communications, don't change them. Use to specify the time (in seconds) after which the target will abort a request. The default value for Operation Timeout property is 10 (seconds). VTScada has a timeout check that is similar to the Operational Timeout and matches the default value of that parameter. In a slow link environment, it may be necessary to make the VTScada timeout slightly longer to account for the transmission time on the slow link. The VTScada timeout will be the Operational Timeout parameter multiplied by the Link Speed Compensator. This is the VTScada timeout value, calculated by multiplying the PLC's Operational Timeout by the Link Speed Compensator. The maximum network link inactivity time in seconds. If there is no communication between VTScada and the PLC for this duration, VTScada will close the connection to the PLC. This setting can be used to terminate connections to PLC that are polled infrequently in order to reduce network traffic. The connection is automatically re-established by the driver when the PLC polling is resumed. Note that the PLC's tag configuration must be re-read when the connection is re-established, therefore you must balance the cost of this increased traffic against the savings of closing the connection. If the High Priority Message Flag check box is selected, the priority of messages is high and should take precedence over all else. Otherwise, the priority of messages will be normal.